As noted occasionally on Rifftides, the creative power of medium-sized jazz ensembles often exceeds their size. Go here to read several posts on that topic. The guitarist Anthony Wilson added to the mid-sized genre’s discography with his Power of Nine in 2006. Over the summer, he revived the group and peopled it with an impressive array of name musicians. Jim Wilke, winner of the Jazz Journalist Association’s broadcaster award, recorded the group and will put them on the air and stream them on the web this weekend. Here’s Mr. Wilke’s announcement with a photograph of the nonet by Jim Levitt. Guitarist Anthony Wilson leads his nonet on Jazz Northwest, Sunday, November 3 at 2 PM (PDT) on 88.5 KPLU. The concert was recorded at Centrum’s Jazz Port Townsend last summer. Truly an all-star aggregation, the group includes Terell Stafford, trumpet, Jiggs Whigham, trombone, Jeff Clayton, alto sax & flute, Anat Cohen, tenor sax and clarinet, Gary Smulyan, baritone sax, Gerald Clayton, piano, Joe Sanders, bass and Matt Wilson, drums. All were on the faculty for the Jazz Port Townsend Jazz Workshop, which took place the week leading up to the festival. Music on the program includes a couple of classics, and two contemporary pieces, one an original by Anthony Wilson who has recorded four CDs with this instrumentation as well as three more an organ trio. He has also toured and recorded as a member of the Diana Krall group. Jazz Northwest is recorded and produced by Jim Wilke exclusively for 88.5 KPLU. The program is also streamed live at kplu.org and is available as a podcast. 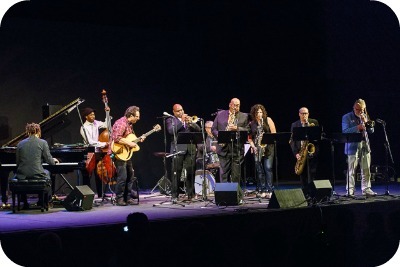 Here is a previous version of the Wilson Nonet with his composition “Hymn” at the Blue Whale in Los Angeles in 2012.